Trump Loves the New Nafta. Congress Doesn’t. 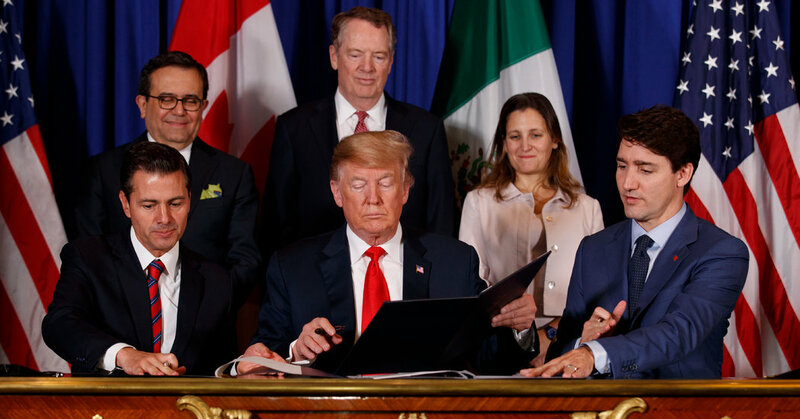 But the pact, which replaces the North American Free Trade Agreement, is currently imperiled in Congress, and both Democrats and Republicans say it has little chance of passing without significant changes. Democrats say the deal does not go far enough to protect workers and the environment, while Republicans say it goes too far in restricting trade, particularly in the auto sector. The stalemate has some business leaders increasingly worried that the administration lacks a winning strategy to move the revised deal through a divided Congress, in a year when a prolonged government shutdown has further eroded what little inclination Democrats and Republicans had to work together on large pieces of legislation. “Partisan rancor has made it more difficult to see any kind of major legislation move forward, including on trade,” said John Murphy, senior vice president for international policy at the U.S. Chamber of Commerce. Senator Patrick J. Toomey, Republican of Pennsylvania, said late last week that he was “doubtful” that the deal, also known as the U.S.M.C.A., would pass Congress given the concerns from both sides of the aisle. “It’s hard for me to see how it’s a priority for Nancy Pelosi to give Donald Trump what would be his biggest economic policy victory, certainly since tax reform,” Mr. Toomey, one of Mr. Trump’s most vocal critics on trade, said in an interview. Privately, some congressional Democrats remain hopeful that the agreement can pass, particularly if negotiations with the administration continue to fly under the radar. Mr. Trump must still submit the agreement — along with legislation laying out how it would be put in place — to Congress. But big hurdles remain to achieving bipartisan consensus that would allow the pact to move through Congress. Mr. Toomey said he could not support the deal without “significant” changes in the implementing legislation. The new agreement inhibits free trade, he said, citing new wage requirements on automobile manufacturing as a particular concern. And many Republicans, including Mr. Toomey and Ron Johnson of Wisconsin, the chairman of the Senate Homeland Security and Governmental Affairs Committee, say they want the White House to remove steel and aluminum tariffs on Canada and Mexico because Mr. Trump had reached a deal with the two countries. Mr. Trump has so far refused to budge on the metal tariffs and has instead threatened to withdraw from Nafta to try to force Congress to vote on the new trade deal. A formal notice of withdrawal would give Congress six months to pass the pact or potentially return to a pre-Nafta trading system with higher tariffs and more restrictive trade barriers. Republicans are warning that such a move most likely falls outside Mr. Trump’s authority and would only reduce the chances of Congress passing the U.S.M.C.A. Republican strategists say that unless Mr. Trump agrees to compromise, he will most likely face defeat. Democrats — including populists who tend to side more with Mr. Trump than Mr. Toomey on trade issues — say they are open to working with the administration to improve and pass the agreement. Party leaders have had productive discussions with Robert Lighthizer, the United States trade representative, to reinforce the need for negotiators to secure additional labor and environmental protections before any floor vote. The Trump administration spent more than a year negotiating with Canada and Mexico to try to salvage Nafta, a 25-year-old pact that has become critical to the North American economy, particularly the automobile and agriculture sectors. The agreement expanded the flow of goods and capital between the three countries, and prompted multinational corporations to stretch their supply chains up and down the continent. While Mr. Trump had long threatened to rip up Nafta, the business community and many Republican lawmakers pushed to keep it intact, insisting that doing away with the pact would ultimately hurt the United States economy. The new deal, which was agreed to in September, primarily updates Nafta but contains some new provisions, including requiring higher wages at automakers and greater ability to sell dairy products in Canada. Mr. Toomey said he remained deeply concerned that the administration had not rolled back the steel and aluminum tariffs that it had imposed on Canada and Mexico after the trilateral trade agreement was reached last year. He is working on bipartisan legislation that would curtail Mr. Trump’s ability to impose tariffs on the basis of national security — which the president used to justify the steel and aluminum tariffs — without congressional approval. The president would almost certainly veto such a measure.